DesignEvo is a simple logo design app that allows anyone to work out a logo design in your fingertips. If you have tons of questions for logo design and don’t know where to begin it, DesignEvo app can be your perfect helper. With DesignEvo for iPhone & iPad, you don’t need to be an expert in design, or have any design skills. The app simplifies logo design to the most. 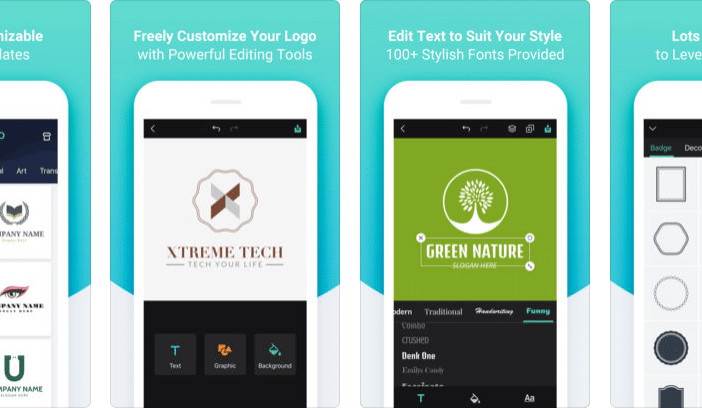 Differed from many AI-support logo design apps, DesignEvo only adds well-designed and human-testified logo templates to its template database. So you may find that its templates look professional and attractive. Give a run of DesignEvo app, you will feel it easy-to-handle. The steps to DIY a logo are: Choose a template, tap an element to customize it, download or share it. Tap any logo element on the canvas and you can make a change. For example, tap a text, it will show you available fonts for customization. Also, it’s easy to add text, graphics & background color to your logo design. Open DesignEvo, you will find it’s well organized. It lists all templates on the horizontal bar, which classifies its templates into easy-to-interpret categories. So you can easily slide left to right and slide right to left, go for a theme, and pick a template to begin with. DesignEvo is an app that offers WYSIWYG editing. The color schemes in its templates feel nice. Take a few steps to DIY a logo, the result can’t go bad. DesignEvo has another online app for logo design, which is more powerful in comparison with DesignEvo for iPhone & iPad. In short, DesignEvo for iPhone and iPad is a shrunk-down version of its online version. Online DesignEvo has additional features, like Preview, Icon Search and in Plus plan, support for SVG vector output. For those who want a YouTube logo for their channel, it provides easy ways to DIY an awesome YouTube logo. Online DesignEvo allows free downloading logo image under 500px*500px. Higher resolution logo needs extra payments. To celebrate 2018 Mother’s Day, DesignEvo exclusively offers our dear audiences a 80%OFF coupon – DEMD55CPF , to its Basic and Plus plan. It’s valid until May 17th, 2018. For those you need such a service, feel free to take advantage of this coupon this time.